A Food bank in Ollerton has received a welcome boost from local construction contractors Robert Woodhead Limited to help feed people who are desperate for food over the winter months. The construction company has raised £500.00 which will help provide essential supplies for people across the Ollerton District. “The company has recently returned to Edwinstowe and we are delighted to be part of the community here. We normally choose a charity every Christmas to support instead of sending Christmas cards. This year we chose the Dukeries and District Food Bank as it is sadly, fulfilling a real local need. 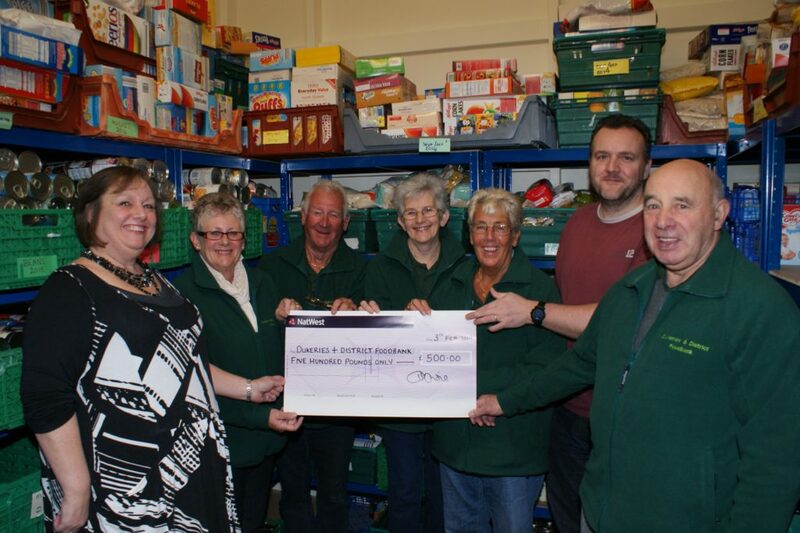 Pictured: Hilary Cheshire, Company Secretary (far left) and Lyn Matthews (next to) with the volunteers from the Food bank receiving the cheque. The Trussell Trust works to empower local communities to combat poverty and exclusion in the UK and Bulgaria. We work with the people that society forgets, providing practical help through sustainable projects and enabling each person to realise that they are valued. Our vision is to build communities where people of all backgrounds are included and have the opportunity to live in dignity with hope for the future. To find out more about the service, visit www.trusselltrust.org or call 07716 439740.